The post contains the agenda of the Entrepreneurship Development Cell which is written, edited and drafted by me. 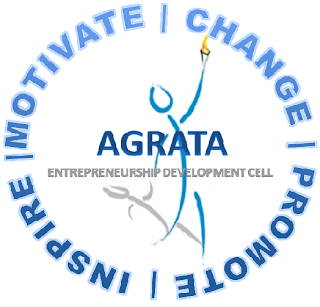 Agrata, a Sanskrit word meaning Leadership completely defines the Entrepreneurship Development Cell. Students are our country's future and the Cell intends to nurture them, provide them with opportunities for excellence. It intends to demystify the working of corporate for students to better understand and emulate, to let the budding entrepreneurs get a feel of how the corporate world works. In all it is the cherished dream of the EDC to create corpocrats (corporates + technocrats) out of the present day technocrats. - The Entrepreneurship Development Cell of IET ROPAR will have the objective of creating, fostering and promoting the spirit of entrepreneurship among the students of the college. - EDC will aim at developing the spirit of entrepreneurship among the students of IET Ropar. - It wants not only to ignite the minds but also to nurture the ideas of the students. - EDC is committed to build a strong platform for the budding entrepreneurs. - The vision is to guide the students to take entrepreneurship as a career, as a path to success, as a journey of wisdom. - It will invite various eminent entrepreneurs to deliver lectures to educate students about the joys and hardships of entrepreneurship. - Guest Lectures, Business Plan workshops, Case study workshops, Knowledge Camps, will be conducted throughout the year to involve students in activities that are essential to an entrepreneur. - EDC will also actively incubate startup ideas by linking the right investors with the right entrepreneurs. Couldn't get it ... Entrepreneurship cell in an engineering college ??? ... So are we making engineers or entrepreneurs .. I am kind of confused ... !!! EDC will be creating technocrats... I have already mention it in the post... in today's world the boundary or more accurately the defining limit of a job or profession is very limited... for a good and competitive engg. you must be having the capabilities and capacities to run a team.. look at the statistics.. our country produces more successful entrepreneurs than any other country in the world.. and EDC just want to nurture the ideas of the students. A growing economy like ours need many new business ideas. Part 2 .. First Job Interview..